Pictures of Hori Melana, and the Cultural Program will be added very soon. This report will be compiled again with more details. Note:Hoii program was arranged by the Oriya Bhajan Group at Murugan Temple Auditorium, 6300 Princes Garden Parkway, Lanham, Maryland 20706. It was a great day for all of us who participated in the program. It was such a memorable event. Although because of rain (aDina megha), the program started a little late, the program was very good. The organizers had devoted their morning in making the stage decorations and hall decorations. Many devoted people from Pennsylvania, New Jesrsy, Massachusetts, Virginia and Maryland joined the function and it felt like a mini regional convention of Oriyas in Eastcoast. The most important achievement was the motivation that was created in the children's mind to be involved, participate and do something. Just looking at the children who were performing in the stage, many other children were motivated to show their talents and that was the effect we wanted to see and we saw it. The "pala" by Pitambar Sarangi of New Jersey was something to see. We also felt that Pitambar Babu's "pala" talent needs more recognition and he should be encouraged to present the "pala" atleast 4-5 times a year. I request that people who plan for any religous event or any other types of event in New York, New Jersey and Philadelphia area please encourage Pitamabar babu to present "pala". Another great fact was the greatness of the temple people. Although our function went beyond time, they were very coopeartive and nice. We felt the brighter side of the human nature, and that is caring, considerate and noble nature. Most of the credits goes to Illa and Arun Ojha for stage decoration. The bimana's entered the auditorium with kirtan and playing of color. The crowd was cheerful. After all the bimana's reached the auditorium stage, Kanan Mishra, Bandita Mishra and Bijoylaxmi Dash did the "Arati". Temple priests Mahashakti Dasa, Mahasringha Dasa and Nrusigha Chaitanya Dasa sang Arati songs while everybody in the audience were invited by Kanan Mishra to do the "bandApanA". Kanan Mishra had taken charge of the Arati and she called everybody with personal affection to do the "Bandapana". Indu Mishra and Shashadhar Mohapatra were at the registration desk distributing the program schedule, name tags and the bhajan patrika. After a formal introduction given by Srikant Nayak, Bigyani Das delivered the welcome speech (50/50 Odia/English). Then she invited Nrusingha Chaitanya Dasa of Baltimore ISKCON temple to coordinate the Bhajan program. Bhajan Program was moderated by Nrusingha Chaitanya Pravuji. He gave many touchy introductions about Lord Krishna's different Lila. His descriptions took the people to Gopapura and some of us felt as if we are visualizing Lord Krishna with Jasoda Mata and Nanda Raja. Bhajan started with Mahashakti Dasa. The bhajan was on Lord Krishna's birth (Nanda kole khele gobinda). Deepa Parija sang the bhajan "Uthilu Ede begi Kahinkire" with Jasoda Mata's love. Deepa being the mother of a few months old daughter reflected the feeling in her beautiful voice. The third bhajan was on Lord Krishna's play and different acts with Gopis (Shyama-sama kamaniya nahin kehire sahi) presented by Surendra Ray. Surendra Ray being a veteran singer and harmonium player reflected the original odissi tune and "bhaba" through his singing. The fourth bhajan was a group bhajan presented by Lipishree Nayak, Meera Mahapatra, Bijoylaxmi Dash and Bigyani Das. This bhajan was a hori bhajan on "Phagu Ranga Bola Angaku Ta Dekha Dekha" and with the combined effort reflected the sensation of Hori Khela in "Gopapura". The last bhajan was presented by Mahashakti Dasa on insisting people to concentrate more on "Krishna Nama". The songs were presented with the help of Surendra Ray and Mahashakti Dasa on Harmonium, Naresh Das and Surendra Ray in Tabla. Lipishree Nayak was the Masters of Ceremony for the cultural program. Lipishree welcomed everybody and thanked Nrusingha Chaitanyaji for his help. Then she proceeded with the items of the cultural program. The stage management, lights and sounds were taken care of by Dhirendra Kar, Surendra Ray, Hosensu Sahoo and Naresh Das. The first item was the Odissi Dance presented by Mrunali Das. Mrunali learns odissi under the guidance of Dr Chitra krishnamurty, the director of Odissi dance school Nrityalaya. The second item was presented by Prerana Pradhan. It was a dance set with the collection of some rhythmic Hindi Songs. This drama was the shortest version of the drama "Bandhu Mohanty". The audio cassette of this drama was made with well celebrated singers and actors in Orissa. 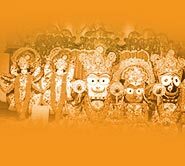 The performers were Bagmi Das (Bandhu Mohanty), Mrunali Das (Kanaka, Bandhu's wife), Siddhartha Mohapatra (Jaganatha in disguise, and King's companion), Satish Mishra (King Prataprudra), Shashwati Das (Bandhu's child), and Suman Ojha (minister). The children did excellent job showing their understanding far above their age level. This drama is very significant which relays the message that God is the only friend we can count on always. The other friends are friends in good times. The costumes for the drama were simple and were designed by the parents of the performers. If you have watched the drama, then you could have probably noticed the talents within all these children. All the children have many talents that stay hidden and they just need a medium to express it. It's our duty to provide them the medium. The fourth item was the skit by Alok and Happy Mohanty of Philadelphia. The skit "jATa dekhA" was written by their mother Sulochana Mohanty. The karate show by Koustuv Das of New Jersey was enjoyed by all. Even Koustuv became a hero by smaller children who started practicing Koustuv's karate in the hall. Swati Mishra played violin first solo and then duet with Bagmi Das. Rutu sahoo presented his yo-yo skills. The last item was a Holi dance with the song "SoNi SoNi" of the movie "mohabatein" presented by Srotalina Nayak and Ritu Desai. The dance was so beautifully presented by the duo, who learn Kathak dance. The first item was a group Hori song "Aji Asichhi re Asichhi, Asichhi Hori" presented by Deepa Parija, Sushim Dalabehera, Lipishree Nayak and Bigyani Das. The song was in the tune of "Bhumru Bhumru" of "Mission Kashmir". The second item was an Odissi song "Re batachhada suhata nagara" presented by Asha Sahu. Asha sang it very well. The third item was the musical "Twinkle Twinkle Little Star" presented by Hosensu Sahoo. The Master of Ceremony Lipishree Nayak ended the cultural program with the song "Purnami Jahna Sate Dharabuke Hasila". With her beutifull voice she presented the mood very well. It was Pitambar Babu again with a new subject and a very interesting subject for this year's pala "Bideshi Babu". Pitambar Babu recited Odia literature to describe New York City. He mapped the life in Odisha during the King's era to today's life of an immigrant Oriya in New York city. I personally appreciate and congratulate Pitamber babu (a Physics toper) for his excellent presentation and wish he keeps this tradition. Pitamber babu was accompanied by Pratap Dash who actually did some of the Gahana role, Naresh Das, and temple priest Mahashringha Dasa. Surendra Ray made guest appearance to present a variety of Pala Presentation. Arun Ojha gave final thanks. Indu Mishra recognized the children for their hard work and Surendra Ray recognized the temple priests for their help with some awards. Arun Ojha then announced the formal end of the Hori function. Arun Ojha has made video recordings of bhajan, drama, pala and the ending. Dhirendra Kar has taken digital photographs which will be available very soon. Everybody participated in the clean up. Special thanks to Lokanath Mohapatra for cleaning the hall.